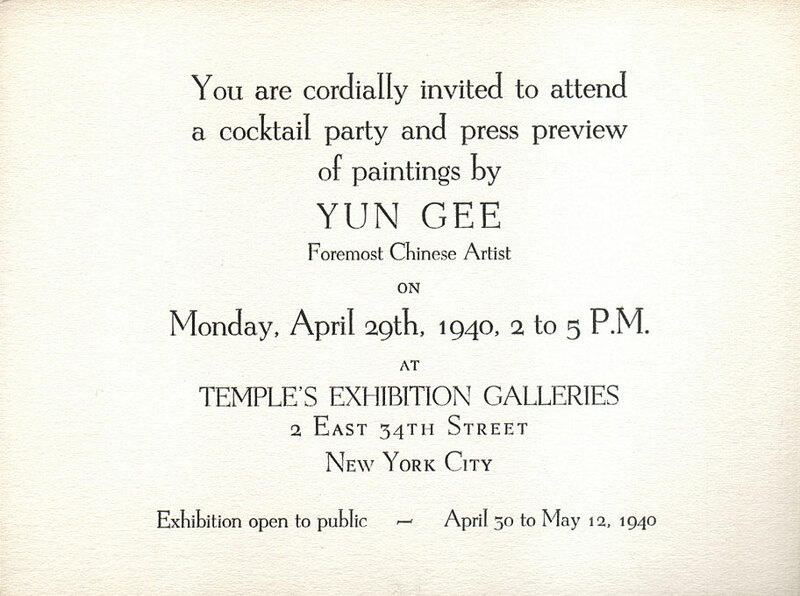 Nearly one hundred canvases by the foremost living Chinese artist, Yun Gee, will go on view next Tuesday, April 30th, at Temple’s Exhibition Galleries, 2 East 34th Street. Although he has been well received in France, has created a considerable stir among the critics, patrons and connoisseurs of modern art in Paris, Yun Gee’s work has not been seen in New York since 1932. Yun Gee is a Chinese patriot, which is rare and meritorious. He is a poet, too, which explains the ‘remarques en surimpression’ with which he decorates his portraits; (on my own portraits, a little bird and a little animal.) I am thinking of the sign which Picasso makes with chalk on the threshold of Ravignan. The metallic coloring of Yun Gee’s is a revelation. One of these portraits of Andre Salmon will be seen in the forthcoming show. Princess Achille Murat and several self-portratis fall in the earlier, or “lyrical” period; while several studies of horses; another group of dancers; and recently completed landscapes of Central Park, a street i Pelham Bay Park and one painting called Knight’s Combat, are classified under the final or “life” period. These three periods of the artist’s development were so named by one of his own countrymen, a Chinese philosopher in Paris. Fantasy and symbolism characteristics of the ancient art of China, is the theme that runs like a subtle thread through the work of Yun Gee. His mural, Wheels: Industrial New York, seems to sum up the artist’s comment on the metropolis; Knight’s Combat, begun before the outbreak of war in Europe a few months ago, Confucius and Lao Tze reveal this subtle, mystical fantasy perhaps even more than some of his other pictures. A sense of decoration, plus a highly effective use of color, are impressive. A complex personality, this young Chinese has translated to his canvas by a thoroughly modern technique, a sensitive emotional reaction to the things he has seen in his travel and study through the Western world. Deeply religious, he devoted himself to spiritual subjects, The Last Supper and Resurrection being two of his most arresting paintings. Nothing if not adventurous, Yun Gee had a fling at cubism, abstractionism and founded a school of “diamondism” in Paris. His cycle of growth, as seen in the group of paintings of his period of “life,” is complete. Yun Gee is a revolutionary painter and has declared war on traditional European painting. There are some who would say he lacks the Chinese character. And for this I want to say that the Chinese brush technique lacks the possibilities of oil. And that is why Pierre Mille says that the Chinese first taught the Westerner to paint and now the Westerner teaches the Chinese to use oil. Yun Gee’s success has been the union of the Western technique of painting with the character of his race, as though melted into one. Yun Gee’s work has been bought by the French government; one of his paintings was purchased for the permanent collection of the Jeu de Paume Galleries. he has exhibited in Paris at the Galeries Zak, Carmine, Bernheim-Jeune, Reine de Margot, Miveau, Van Leer, Vallotton, Bonaparte and others; French patrons include Mme. Lucien Murat, Marquis A. Pourvouville, Princess Achille Murat, Paul Guillaume, Vollard, and other leading collectors. Yun Gee’s paintings will be on view at Temple’s Exhibition Galleries from Tuesday, April 30th, through Sunday, May 12th.